When I first called this “The Breakfast of Champions” I was being facetious. Unlike its eponymous namesake, it has basically all the wrong things going for it. It’s high in fat (thanks to the salami). It’s high in sodium, thanks to the cheese and the salami, and it’s high in sugar due to the massive carb-load of the bagel. Also, it doesn’t even contain eggs (which Hazel Grace would object to). That being said, it tastes really, really good, and is perfect for those about to trek out into the cold, cruel word who need to be fortified for a long time. 1. Toast the bagel (lightly). 3. 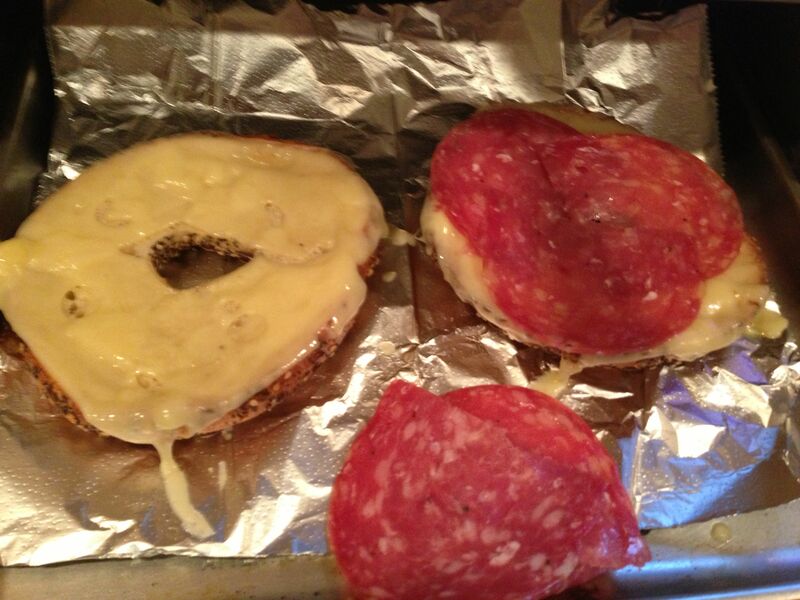 Finish by covering the melted-cheese bagel with salami and toasting on high, or broil (if you promise not to walk away from the toaster). 4. When salami is crisp, and cheese bubbly, remove from toaster and let set, two-three minutes. If you don’t allow it to cool, the cheese will slide off. Let it set and cut into halves (or make a sandwich). My father used to make this for breakfast, where I grew up outside of metro New York City. 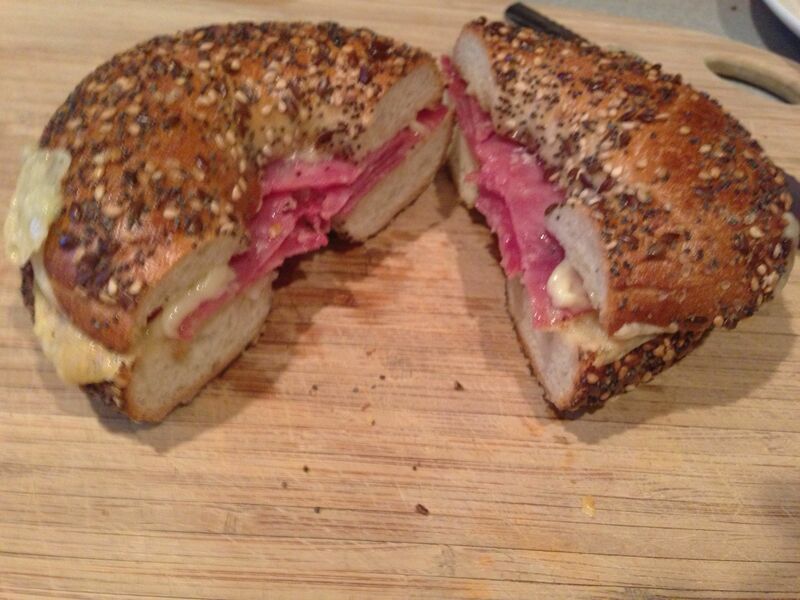 There, you can’t fall down without hitting a great bagel. Now, I live in Massachusetts and look though I might, it seems great bagels are hard to come by. You can argue with me, but you can’t win. It’s a matter of taste and birthright; if you were born in the tri-state area, you likely have a higher standard for bagels than the rest of the country. I don’t why that is, but I know that people who move to Massachusetts from California simply stop eating Mexican food. Is our Mexican food bad? No, it’s just that they are used to something very different, likely more authentic, and in all reality (with few exceptions), much much better. And really, Mass is kind of weird that way. Though I have eaten in Chinese restaurants around the country and on both coasts, only here in Massachusetts did I find Chinese restaurants that serve rolls with dinner. Bread rolls. Rolls made of bread. But I digress. Making a great meal, even for the low arts, starts with the best ingredients (when you’ve got ’em). 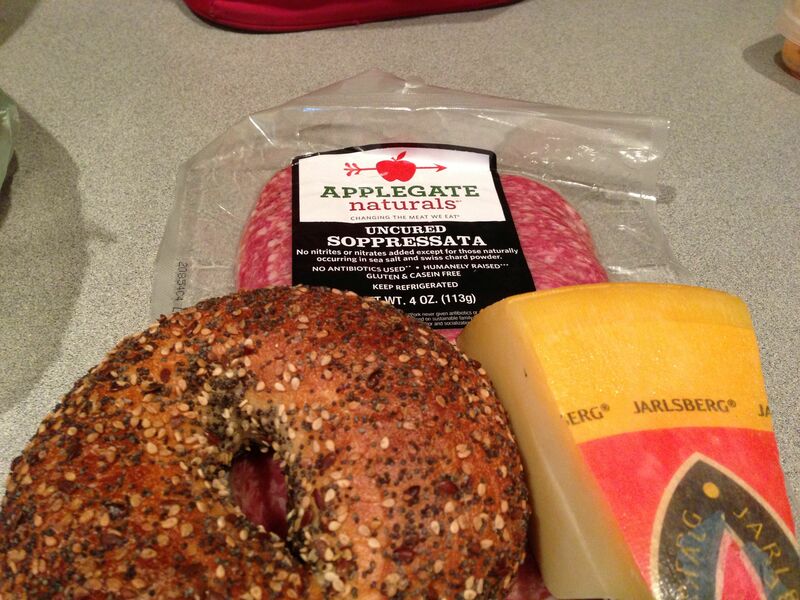 history of soppressata and cured meats and I don’t doubt there are better, more authentic versions out there. But Applegate is good and easily available; and it in comes in a package (horrors!) which makes it easier to keep inventory control. Jarlsberg, is of course, the most famous brand of Swiss Cheese, and is frequently sold in triangles, guaranteeing it will be nearly impossible to slice. However, you’ll need to slice it. The second thing is patience. You may want to simply toast everything together, but I find skipping any of these steps results in things being soggy where you want them to be crispy or spongy where you want them to be melty. Posted in Food Writing & Other Stuff, Meals and tagged bagel sandwiches, breakfast sandwich, Hazel Grace, Massachusetts, Swiss Cheese on May 24, 2015 by Robert Deutsch.